Losing a disk partition can really make your day. It can happen in lots of ways, including viruses, bad software, and operator error. Safe365 Partition Recovery Wizard can recover and restore lost or damaged partitions in many cases. It can recover partitions on most hard disks, including IDE, ATA, SATA, and SCSI drives and FAT, NTFS, and EXT formats, for both 32-bit and 64-bit Windows. It recovers MBR and GPT partitions, too. Step 1: Install and Launch Safe365 Partition Recovery Wizard on your computer. 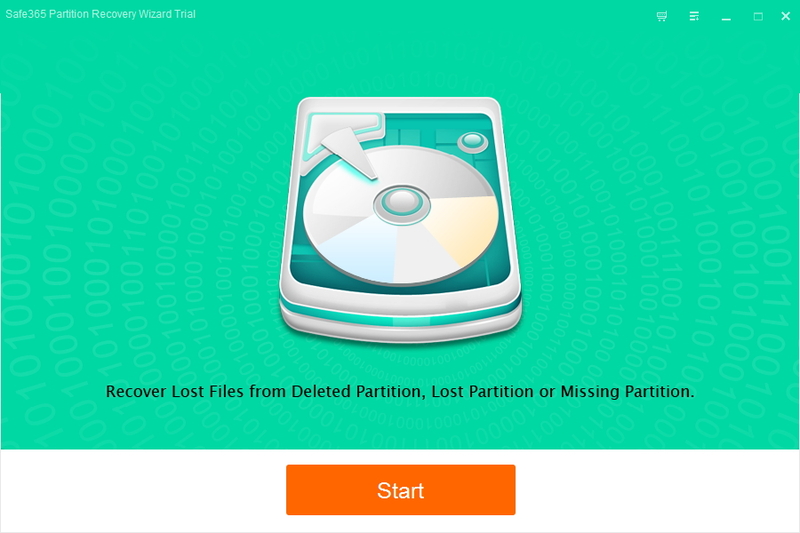 Click on the download icon to get a free trial version of Safe365 Partition Recovery Wizard, and double click to install the software on your computer. Then run it. Step 2: Click "Start" button, choose a disk where you want to recover lost partitions and click "Scan" to continue. Start searching the deleted or lost partitions. Step 3: After the search is completed, choose the deleted or lost partitions to recover. If Safe365 Partition Recovery Wizard cannot find your deleted or lost partitions with Fast search method. Please choose "Deep Scan" to start Complete search method.